Three seasons’ rooms are similar to sunrooms and screened porches, but the true difference is that it is a space without a heat source and with enclosed windows instead of screens. They are a great option and allows you to enjoy the feeling of being outdoors for almost the entire year. And, while it adds a very livable space, it is not considered additional square footage on your home because it is not heated space. 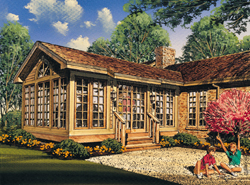 Our collection of 3-season room plans includes many styles and sizes perfect for enjoying the outdoors for many additional months throughout the year. We have detailed blueprintsso you can easily complete your project yourself. With a wide variety of plans, we are sure that you will find the perfect do-it-yourself project to fit your needs and lifestyle.